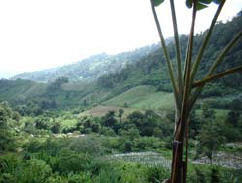 Where is this place / Bukit Tinggi New Village? The land from afar. The cleared patch in the middle of the photo is the approximate location of the subject property. The blue line shows the approximate flow-line of the river. At the far end is where Selesa Hillhomes and the Karak highway is. Most of the land here is planted with vegetable. As the surrounding is still very green, the air is clean and fresh. The white patches are chili farm. 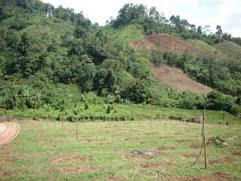 Photo taken from the gravel road at the front of the land which is cleared. The uncleared portion is the river reserve which is at the valley. The blue line shows the approximate course of the river. 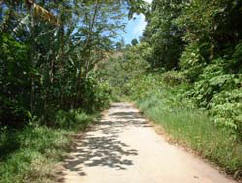 The gravel road is soft and can only be used by motorcycle and 4-wheel-drive vehicle. However, there is a tar road across the river which is being used to access this land too. This is the tar road which is on the opposite side of the river but on a much, much higher ground. So high that it can only be access on foot. The owner's worker is using this road to access (across the river) the farm. Further up this road is a beautiful waterfall. 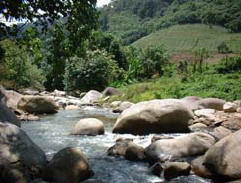 This is the crystal clear and beautiful river running at the back of the land. The land is on the right of this river and on a gentle slope. This location where the photo is taken can be accessed only after climbing down from the tar road (as mentioned earlier in the left photo).